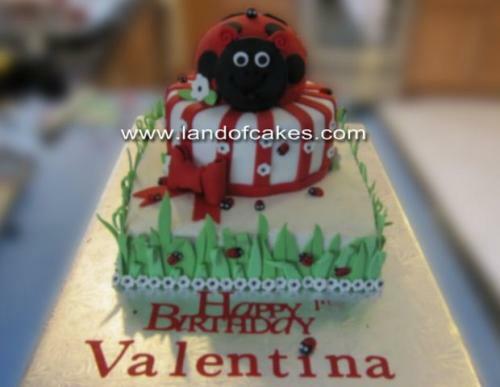 Looking for Ladybug cakes birthday Cakes in Long Island New York? Our ladybug cakes are the perfect birthday cake and a customer favorite. For this project we created a specialty cake that is made of 3 delicious tiers. One tier is a scrumptious chocolate cake with layers of chocolate butter cream made from scratch in our New York bakery. Another tier is a vanilla sponge cake filled with our delicious buttercream. The third tier is a vanilla cake with our special raspberry chocolate ganache filling that is to die for. All the decorations you see on the ladybug cakes are 100 percent edible and ready to crawl into your next ladybug birthday party. As with all of our cakes this was delicately handmade and carefully pieced together in our kitchen. We take our art seriously as we want each and every customer to enjoy each custom treat that we create. You will definitely find that our ladybug cakes are well designed and very tasty compared to other New York bakerys. We strive to be the best at what we do and hope you enjoy our work. This ladybug cake is easy to order. Simply fill out the form below and someone will contact you promptly. You may also contact us directly by phone. Thank you for choosing Land of Cakes New York.